Above are images of a cervical MRI a pre and post of a patient with a herniated cervical disc. I recently added the brand new Cox table to my arsenal and this table has been improving patient outcomes. Published Outcomes of the Cox technic. "Patients with radiculopathy did significantly better with FD." The combination of Cox Flexion distraction combined with DRX 9000 spinal decompression has been providing excellent results for my patients in my NYC practice. 2. 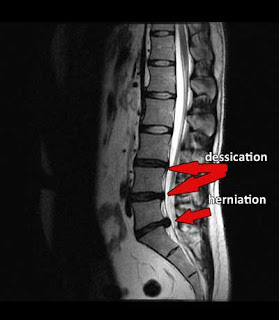 Flexion decreases disc protrusion and reduces stenosis. Note: Discs protrude and degenerate into the concavity of a curve, into the side of extension. 4. Flexion opens the vertebral canal by 2 mm (16%) or 3.5 to 6 mm more than extension. 7. The nucleus pulposus does not move on flexion. Intradiscal pressure drops under distraction to below 100 mm Hg. On extension the nucleus or anulus is seen to protrude posterior into the vertebral canal.